Tommie Albert Collins III was first exposed to graphic design when it came rolled up in his grandmother’s subscription to The Chicago Sun-Times. As a kid, he would wake up on Saturday mornings and pore over the comics with a bowl of cereal in hand. The antics of Garfield were a favorite. 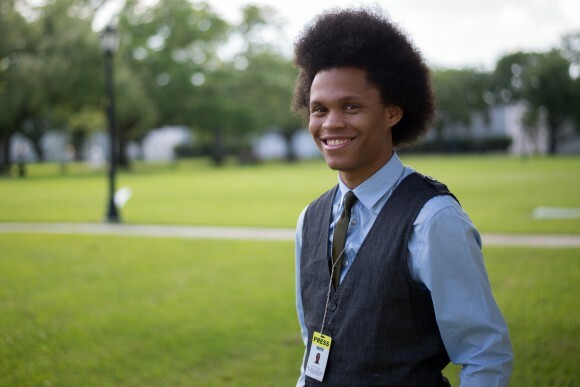 Now he is a rising senior at Hampton University, where he studies graphic design and English. He has worked as the visuals editor for the school newspaper and the yearbook, and always has a few freelance projects in progress. He relishes the challenge of catering to a client’s needs while maintaining an artistic voice in the final product. After he completes his undergraduate degree, he wants to attend graduate school at New York University or Columbia University and continue his studies in graphic design. Mr. Collins hopes to work as a designer for a major news publication such as Wired or The New York Times. His long-term goal is to open a performing arts school for students who come from less-than-privileged backgrounds. “I really want to bring that creative outlet back to my community because there’s so many kids that have talents that are wasted because they don’t have the resources to nurture those skills,” he said.